As the new year begins, a terrifying evil from across the centuries of Earth’s history is stirring. As the Doctor, Ryan, Graham and Yaz return home, will they be able to overcome the threat to planet Earth? Michelle Collins, Joe Swash, Bobby Davro, Stephen Bailey and Cheryl Baker learn about life under canvas. It’s Bobby’s 60th birthday and the gang want to make him breakfast, but are foiled by the lack of an electric kettle or room service. With germophobes, arachnophobes and very few practical skills present, what could go wrong? On the planet of Ranskoor Av Kolos lie the remains of a brutal battlefield. But as the Doctor, Graham, Yaz and Ryan answer nine separate distress calls, they discover the planet holds far more secrets. Who is the mysterious commander with no memory? What lies beyond the mists? Who or what are the Ux? The answers will lead the Doctor and her friends towards a deadly reckoning. The Severn. Shobna Gulati takes a revealing stroll through Shropshire and Worcestershire along a now tranquil and quiet stretch of the Severn River which was once the hub for hundreds of boats that served the industries which had grown up along its banks. It is a voyage of discovery Shobna, as she learns about a part of the country that is a world away from her native north west. Documentary series filmed aboard the destroyer HMS Duncan. The mood on Duncan changes with the news that a chemical weapon is reported to have been used in Salisbury. When a second chemical attack takes place, this time in Syria, the ship goes to action stations for the very first time. Documentary series following the army of workers who keep one of London’s busiest shopping streets moving. London is melting in the grip of a heatwave, plus the annual Pride Parade is taking place. The heat results in nearly 200 casualties, tons of rubbish, dogs on death’s door, celebrity photographers and summer crowds late into the night. Documentary series filmed aboard the destroyer HMS Duncan. The ship and its crew are deep in the heart of the Black Sea, heading towards Crimea, when a Russian ship HMS Duncan has been tracking suddenly disappears. The crew discover that the Russians are also tracking them and the situation soon escalates. Documentary which recalls the downing of the Pan Am flight in December 1988. The stories of six victims and six survivors are told, including the man who got drunk at Heathrow and missed the flight, the mother and daughter who flipped a coin to decide who would travel, and the father taking his young family on holiday. Documentary series following the army of workers who keep one of London’s busiest shopping streets moving. Sandro and his team work through the night to redress Benetton’s flagship store before the doors re-open. Engineer Jenna has to get the new Crossrail station ready for an open day. Anticipation is high as staff at Christys’ hat shop wait for a special guest. 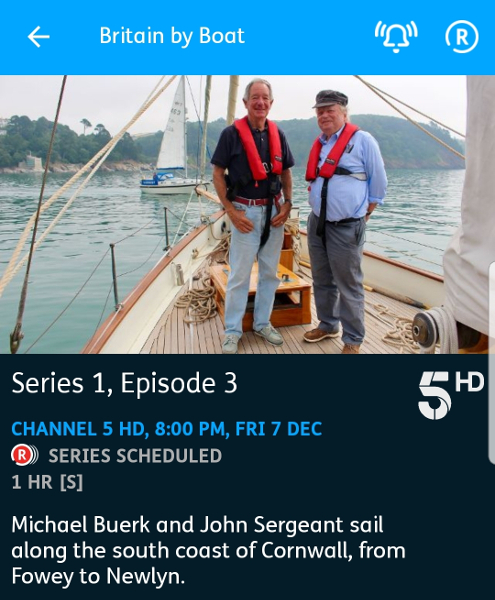 Michael Buerk and John Sergeant sail around the UK coast. After shopping for supplies in the historic harbour town of Fowey, our competitive shipmates make their way along the south coast of Cornwall to Newlyn, near Penzance. En route they try their hand at kayaking, fishing, plying the oars on an ocean rowing boat, participating in a sea shanty festival and joining the RNLI on a rescue drill. Documentary series. Michael Portillo explores the popular destination of Brighton, where he goes in search of the hidden history of the British seaside resort. The ghostly skeleton of Brighton’s West pier has become one of the UK’s most well-known ruins, and is all that remains of one of the most iconic seaside attractions in British history. The Doctor, Ryan, Graham and Yaz arrive in 17th-century Lancashire and become embroiled in a witch trial run by the local landowner. As fear stalks the land, the arrival of King James I only serves to intensify the witch hunt. But is there something even more dangerous at work? Can the Doctor and friends keep the people of Bilehurst Cragg safe from all the forces that are massing in the land? One of the great advances of the 19th Century, the railways were a tool of empire. How did the Victorians use them to expand their influence? Documentary series filmed aboard the destroyer HMS Duncan. Heading out to the Med and the Black Sea, the 280 men and women onboard face a heart attack, a man overboard, and a show of force from Russian airplanes. Just five teams remain in the Lego Masters semi-final, all of them facing a huge fight to get through to the final. The teams need to access their artistic side as first they’re challenged to create a bust of a live model, Johnny Vegas. Using the plastic building bricks, the teams must create a sculpture that not only looks like Johnny, but also expresses his personality. And he’ll be the one to judge who’s captured him the best. Next, the teams head for the Lego Masters House of Fun, where they must create a playable, life-size arcade game. It needs to not only look great, but must also function just like the real thing. Presenter Melvin Odoom and judges Matthew Ashton and Fran Scott will be testing each game for actual playability. Tony Robinson takes an exciting tomb-hunting adventure across Egypt to investigate the startling series of recent tomb discoveries that are revealing new facts about life in the ancient world. He enters tombs that have been sealed shut for thousands of years, meets mummies, holds an Ancient Egyptian prime minister’s heart and discovers hieroglyphs only ever seen by the ancient Egyptians who created them. In this final episode, Kevin exclusively reveals the winner of the most prestigious prize for residential architecture, the Riba House of the Year 2018. But first, alongside architect Damion Burrows and design expert Michelle Ogundehin, he explores the last group of houses on the long list. Each one uses materials in interesting ways. In leafy Berkshire, there’s a perfectly crafted timber box, with sleek concrete floors and giant six-metre windows. In Belfast, there is a small but perfectly formed house with black larch cladding. In Surrey, a completely revamped 1930s house with a pale brick and glass modernist extension blends beautifully into its setting. And finally, an experimental house in London makes the materials it’s built from part of the design. Kevin then reveals which of these properties has made it onto the shortlist before exclusively announcing the overall winner of House of the Year. 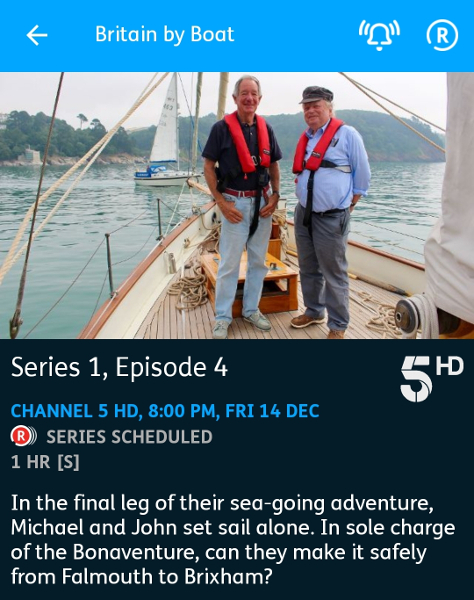 Travelogue series reuniting Michael Buerk and John Sergeant to explore Britain’s coastline by yacht. Missing the morning tide out of Portsmouth, the duo visit HMS Victory. Then they set sail to Cowes, where too much champagne inspires a race in small sailing dinghies. Finally they decipher the maps to make their way past the iconic Needles to Poole. 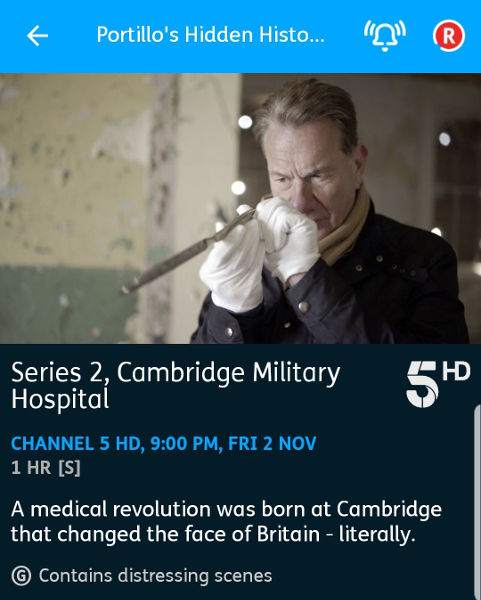 Michael Portillo explores abandoned locations. The New Victoria in Bradford was Britain’s first cinema, with a 3,000-seat theatre, a decadent ballroom and state-of-the-art technology. It closed in 2000, but a new generation has reinvented the building. A mysterious message arrives in a package addressed to the Doctor, leading her, Graham, Yaz and Ryan to investigate the warehouse moon orbiting Kandoka, and the home of the galaxy’s largest retailer, Kerblam. Following the remarkable story of 18-year-old Billy Monger, one of Britain’s most exciting young racing drivers, who in April 2017 was involved in a devastating crash, resulting in the amputation of his legs. Incredibly, soon after his accident, Billy resolved to get back to racing, in the hope of becoming the first ever amputee to race competitively in a single-seater racing car. Kevin McCloud, architect Damion Burrows, and design expert Michelle Ogundehin visit four more stunning homes looking to be crowned Riba House of the Year 2018. This time, the theme is Extreme Houses. There’s an awe-inspiring set of cantilevered black boxes which push the limits of engineering; a far-flung 21st century crofter’s cottage by a Loch in Scotland; a curvaceous minimal concrete home in London; and in Northern Ireland, a sculptural home designed around a single shape – the wedge. Which of them will make it onto the shortlist for the overall big prize? 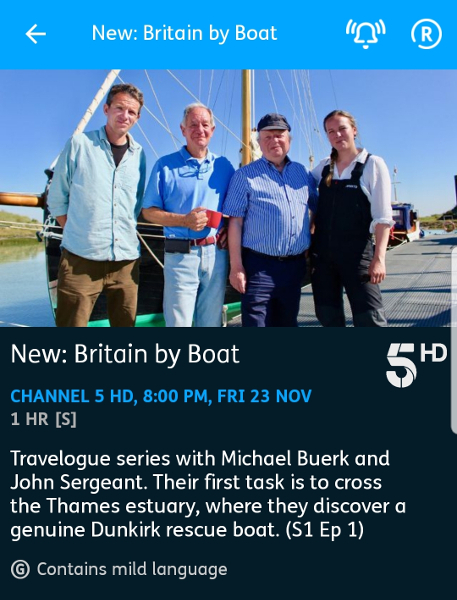 Travelogue series reuniting Michael Buerk and John Sergeant to explore Britiain’s coastline by yacht. Their first task is to cross the Thames estuary, where they discover a genuine Dunkirk rescue boat and are challenged to eat oysters gracefully. Simon Reeve embarks on the third leg of his epic four-part journey around the Mediterranean. He begins in Libya – a country torn apart by revolution, insurgents from the so-called Islamic State and western air strikes. Travelling west along North Africa’s Mediterranean coast, Simon journeys through Tunisia where he meets a man who is keeping Berber traditions alive by harnessing camel power to make olive oil and excavating rock by hand to build new Berber homes. From Tunisia, Simon boards the overnight ferry to Sicily. Here he meets three inspiring sisters who – despite constant intimidation – are making a defiant stand against the mafia. Documentary series about one of the UK’s busiest transport hubs and the western rail network it serves. Huge delays occur after a man is hit by a train at Southall, and more chaos occurs when the power out on track is accidentally switched off. Meanwhile, hundreds of train enthusiasts descend on Paddington to get a glimpse of the world-famous Flying Scotsman. Documentary following the men and women of the Royal National Lifeboat Institution (RNLI). As storm Ophelia hits the British Isles, on the south east coast of Ireland the Rosslare crew try to rescue a small yacht with three people on board. In Devon, the crew at Appledore race an incoming tide to try and reach a man stuck fast in quicksand, while on the north coast of Cornwall, the crew of St Agnes must battle through huge breaking waves to reach two young boys being swept out to sea in a deadly rip current. Two-part observational documentary following a team of injured British and Australian veterans as they embark on an extraordinary near 1000-mile expedition across Western Australia’s remote Kimberley region. The Duke and Duchess of Sussex welcome the veterans at the Invictus Games in Sydney after their dramatic expedition across Western Australia. Professional deep-sea diver Adrian Corrigall is obsessed with concrete. He fell in love with this cold uncompromising material in the skateparks of Scotland. Now he’s convinced his wife Megan to agree to build their new family home in rural East Sussex almost entirely out of the stuff – both inside and out. No cladding, no carpets, no plaster or wallpaper – this will be as pure a concrete building as possible. Construction involves cutting-edge technologies conceived in Switzerland and never used to build a house before. The hope is these new mix recipes will overcome the historic negatives of concrete and keep costs down. However, the perils of being a pioneer soon become evident. With both schedule and budget under strain, Adrian is forced to resume work as a diver, servicing North Sea oil installations and taking him away for a month at a time. With Megan now left juggling the build, all the while looking after three young children, the concrete dream seems a long way off. Documentary series focusing on the work of the North West Ambulance Service. Call handler Elly tackles an increasing volume of calls, and there are surprises for paramedics April and Clare. Reality contest as railway modellers compete to create miniature masterpieces against the clock. The Fawley Fliers, The Diesel Dynamos and The Railway Children are the teams competing, and they each have to create a railway layout based on the creatively taxing theme ‘Fire and Ice’. Four-part series about the Lake District, the National Park that is now a World Heritage Site. 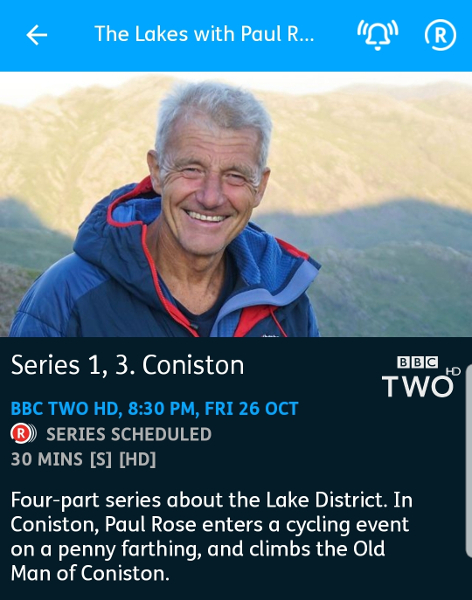 In this episode, Paul Rose heads to Coniston, where he enters a retro-cycling event on a penny farthing before joining the mountain bikers of Grizedale Forest. He relives the final moments of Donald Campbell in his attempt to break the world water-speed record on Coniston Water, and ends his trek by climbing Dow Crag, before ascending to one of the area’s best-known hills, The Old Man of Coniston. Rob Bell explores the lost landscapes and infrastructure of some of Britain’s former railway lines. Rob unearths the lost line from Ruabon to Barmouth, taking a memorable trip across the ‘Stream in the Sky’ on the breath-taking Pontcysyllte Aquaduct. Two Doctors stranded in a forbidding snowscape, refusing to face regeneration. A British army captain, seemingly destined to die in the First World War but taken from the trenches to play his part in the Doctor’s story. In the final chapter of the Twelfth Doctor’s epic adventure, he must face his past to decide his future. Along the way he realises the resilience of humanity, discovering hope in his darkest frozen moment. It is the end of an era, but the Doctor’s journey is only just beginning. 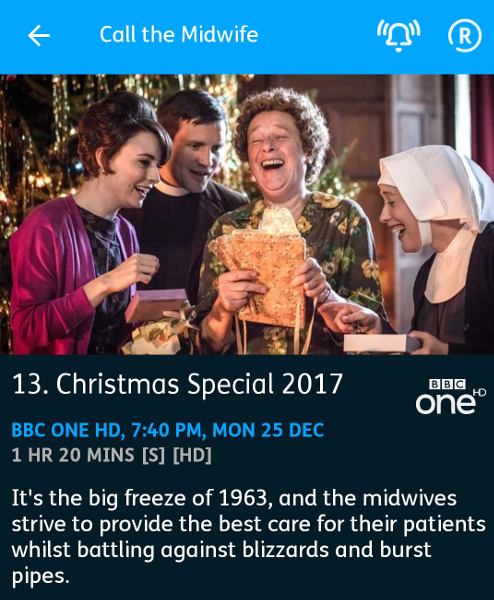 Drama about a group of midwives in 1960s London, based on the memoirs of Jennifer Worth. Boxing Day brings a large snowfall that covers the country. The adverse weather causes major disruption across Poplar as roads become blocked and pipes freeze. Trixie’s holiday with Christopher is cancelled due to the snow. Valerie helps an unmarried couple living in a caravan prepare for their baby. As the labour progresses, unforeseen complications knock Valerie’s confidence in her ability as a midwife. Tom is offered a new position in Birmingham, but it would mean him and Barbara leaving Poplar for at least six months. It’s all hands on deck to help during the weather crisis, so Shelagh comes back to work. Nurse Crane meets her match in Sergeant Woolf as he challenges her driving ability and Akela leadership. First of two Adventure Show specials in which Cameron McNeish journeys over 300 miles through some of Scotland’s most impressive wild places. Travelling on foot, by bike, by pack-raft and with his beloved camper van, Cameron begins his journey in the whisky country around Ben Rinnes before heading over the wild Dava Moor and into the Cairngorm mountains and glens that have shaped his life. He finishes this part of his journey in the remote splendour around Loch Rannoch, and along the way he meets scientists, historians and outdoor enthusiasts, and finds the only railway station in Scotland that hosts regular ceilidhs. Second of two Adventure Show specials in which Cameron McNeish journeys over 300 miles through some of Scotland’s most impressive wild places. The second part of his journey takes him from the Falls of Bruar, south east to the magnificent Angus Glens before turning north to Deeside and finishing in the Cromdale Hills. During his travels he joins a descendent of the travelling folk, meets a collector of traditional songs and has first-hand experience of how illicit whisky stills once worked. He also meets two people whose lives have been changed by the outdoors.